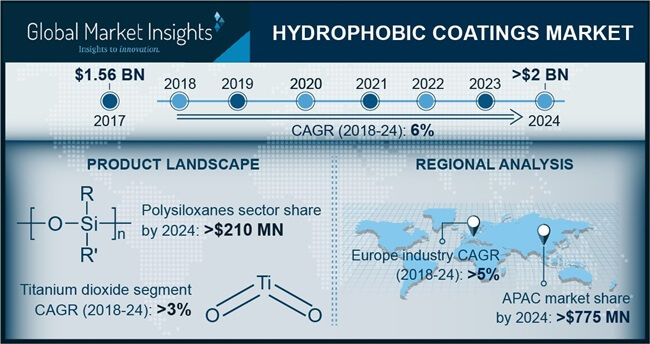 Hydrophobic Coatings Market size is set to surpass USD 2 billion by 2024; according to a new research report by Global Market Insights, Inc.
Increasing development of water-repellent materials has recently attracted a lot of attention due to wide range of applications that these surfaces offer hence, expecting favorable hydrophobic coatings market growth. Self-cleaning surfaces, stain resistant textiles or anti-icing Coatings, anti-fouling materials, are just some examples that show the potential of these materials. Additionally, the development of paints and Coatings for outdoor use will further propel product demand. China fluoropolymer based hydrophobic coatings market size is expected to surpass USD 110 million in the projected timeframe owing to increasing electronic regional market. It is resistant to acids, solvents and friction. Increasing consumer preference towards high quality electronic products along with rising investment in Coatings industry braced by implementation of sustainable techniques will have a positive impact on market growth. Hydrophobic coatings market size from aerospace application may witness significant gains up to 5% by 2024. The product would be applied to whole surface of plane and could help prevent buildup of ice deposits. The ice-building up on the exteriors of aerospace machines owing to flying higher altitudes and encountering supercooled water when flying through low-lying clouds could cause substantial problems, including drag and lift specially, accumulations of ice could result in severe transportation problem owing to imbalances of aircrafts under a high speed. Heavy capital expenses in infrastructure capabilities, expensive treatment and corrosion in contrast to easily available substitute including hard-wax will restrict industry profitability, thus affecting hydrophobic coatings market price trends. Emissions released by overheated PTFE are toxic to humans & animals and does not provide same resistance to deterioration which may bound industry growth. Hydrophobic coatings market size from medical application is anticipated to exceed USD 60 million by 2024. With the product properties of repellency to fluids, blood, and tissue sheets which slide off easily. It keeps surgical tools clean and reduces risks of infection and contamination in patients owing to its anti-microbial, self-cleaning and antifouling properties, thus stimulating product demand. Metal substrate segment may witness strong gains up to 6% by 2024. The product is transparent fluid resistant and durable which has been developed for corrosion mitigation. They have high concentration than traditional organic polymer Coatings and are electrically protecting, ensuring improved barrier properties to water and corrosion. Metals attract water owing to electromagnetic attraction causing corrosion. The product can be applied easily & safely without complications machinery which would boosting market growth. U.S. titanium dioxide based hydrophobic coatings market size is anticipated to exceed USD 20 million in the projected timeframe owing to anti-smudging and easy-to-clean properties. They are very effective for developing durable and mechanically stable Coatings that can also serve as a barrier. It has extensive usage in cements, paints, window glasses & textiles application which will contribute towards regional product demand. Hydrophobic coatings market size from anti-microbial property may witness significant gains up to 4% by 2024. Antibacterial and water-repellent Coatings on textile surfaces are being increasingly utilized as they are healthier and more comfortable on garments in daily life. Manufacturers are using sol gel techniques which have recently attracted a wide attention to develop innovative high value-added products. Global hydrophobic coatings market share is fragmented and competitive with major players including DryWired, NeverWet, 3M, Aculon, PPG, NEI Corporation, AkzoNovel, Cytonix, and Nippon Paint.